In this weeks top list, we take a look at what we think are the best enemies from the original Legend of Zelda on the NES. While it didn’t quite have the quantity of enemies that future Zelda games had, it did mark the debut of many of the most memorable Zelda enemies that have since become regular baddies. Every single one of the Legend of Zelda Enemies, with the exception of Patra, have appeared in future Zelda titles. Which enemies do you think made the list and what would your personal list look like? Darknuts were always one of the more challenging enemies in Zelda I. After being slaughtered by these caped knights, their threat as an enemy skyrocketed. The extra challenge has made them one of my favorite enemies throughout the Zelda series. The Stalfos is my favourite enemy mainly because it’s my favourite general Zelda enemy, and so it was awesome seeing the origins of the enemy. Other enemies in the list were awesome challenges in terms of combat and couldn’t just be killed by a simple slash. For example the Darknut was very difficult to kill unless you got behind it, making for an awesome swordfight duel! I picked the enemies that had the most impact on my experience with the original LoZ. Facing Wizzrobe was always a challenging endeavour that really forced you to utilize any movement option you had. And the others had a similar effect, though were bested or avoided a little easier than Wizzy. From the original Legend of Zelda games I was always a fan of the Octoroks and how you could use your shield to block their attacks. I also wish that Lynel’s made their transition into 3D in some way because they don’t appear very often in the games and that makes them more special. Zelda on the NES allowed you to use your imagination more and the designs in Nintendo Power and in the game manual made the enemies seem much more real then their 8-bit sprites were. Enemies like these should never be forgotten. From the Darknut’s tricky maneuvers to Wizzrobe’s magic attacks, these enemies are sure to bring you some trouble if you cross paths. 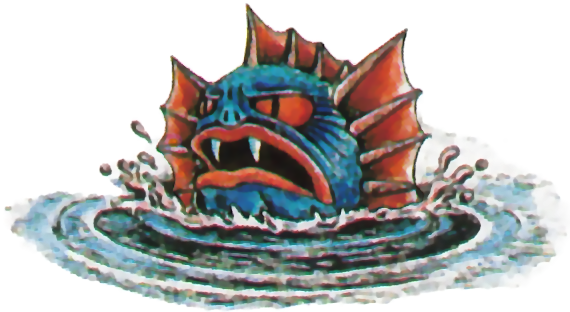 What I loved about the original Legend of Zelda is that final dungeon had brand new enemies in the form of two variants of the Lanmola and Patra. The Lynel is my favorite enemy in the game and I wish they appeared more often in future Zelda titles. Who’s list do you think is most accurate? What 5 enemies do you think are the best from the original Legend of Zelda?